2014 seriously flew by! I kept head spinningly busy with work, house renovations, traveling, beagles, and surf. Of course I also ate tons of great food through out the year. Here are my top 5 Best Bites of 2014! 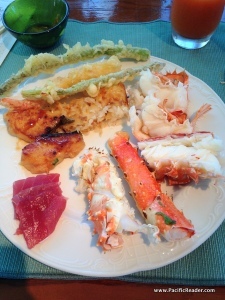 This is my favorite place to have brunch and at $65 a person it’s worth every bite of lobster and crab! The buffet spread is smaller than Orchids, but the dishes are better and higher quality. The fresh seafood is my absolute favorite and the two waiter service per table makes the dining experience one of a kind. Tucked among the bustling shrimp trucks in Kahuku is a tiny silver yogurt truck called Ono Yo. This is my favorite place to get a sweet treat on the island. 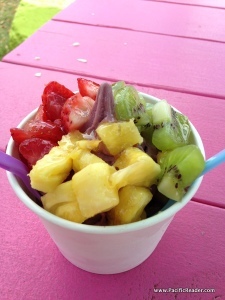 My favorite is their acai yogurt fruit bowl with made fresh daily greek yogurt. Their pineapple yogurt is my second favorite! Chef Lee Anne Wong famous from Top Chef recently made the big move from New York city to Honolulu and opened up this brunch hot spot. 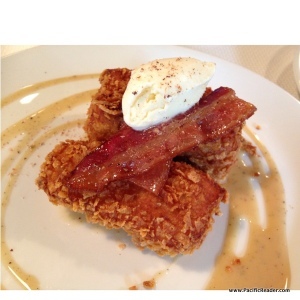 Most people rave about the skillets, but my favorite item on the menu is the Cornflake French Toast. It’s pretty much a dessert and not big enough to be an entree on its own, but let me tell you one bite of this and you’ll be dreaming about it. It’s made with billionaire’s bacon, creamy black pepper maple, and frosted flake gelato. I’m loving the new Highway Inn where Hawaiian food meets trendy Kaka’ako. Their menu has a mix of the local staples and some modern dishes like this one. I love going to Highway Inn for breakfast especially because almost every dish comes with eggs and you can even get poi pancakes. I wasn’t sure what to think of this dish when it was listed on the menu, but it is a mess of deliciousness! 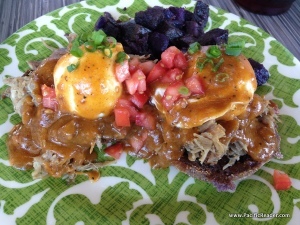 This Hawaiian style eggs Benedict is made with kalua pig, taro muffins and a flavorful red sauce with a kick. I had to give the last Best Bite of 2014 to Steven for making this insanely good dish made with deer he hunted in Lanai. 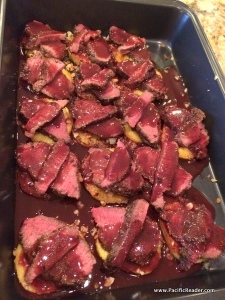 The venison had the texture of filet mignon and Steve spent several days perfecting his demi-glace sauce. The guests at the party we took this platter to could not get over how fantastic it was. Kudos to my creative and talented husband that continues to surprise me! Happy 2015! I can’t wait to see what 2015 has in store for me and what delicious food I will find! Comment this post and tell me about your own Best Bites of 2014!